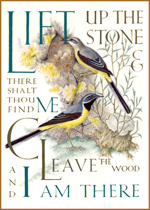 Outside Quote: Lift up the stone and there shalt thou find me: cleave the wood, and I am there. 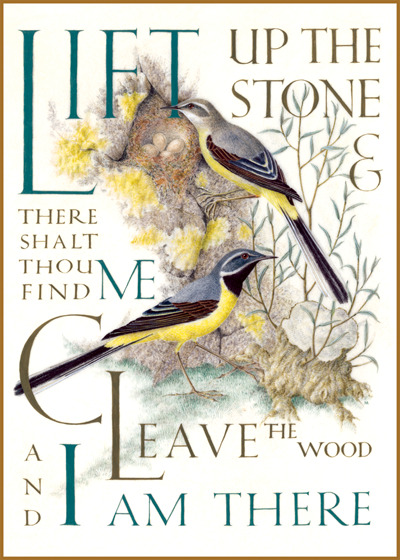 British artist Marie Angel (1923 - 2010) possessed three gifts calligraphy, illumination and painting in miniature. She gloriously combined them in many books. This series of illuminated quotations was made for The Green Tiger Press in the 1980s. (BLANK INSIDE): Our notecards are custom printed at our location in Seattle, WA. They come bagged with an envelope. We love illustration art from old children's books and early, printed ephemera. These cards reflect this interest in bringing delightful art back to life.